DEB ROBERTSON WRITES....: How about a swap to brighten our winter days??? How about a swap to brighten our winter days??? We all love to find treasures at thrift stores and garage sales. We love things others cast-off that we can make good use of. It is the ultimate recycling and such fun too! 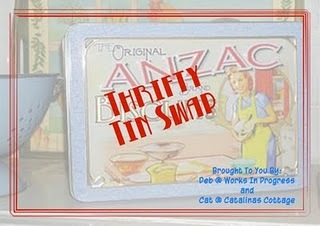 So, Cat and I are suggesting an ANZAC Bloggers Thrifty Tin Swap! I love this idea!!! I am going to sign up but shhh don't tell my mama or she'll tell me off for getting too busy again! Now to start looking for a tin ... awesome idea ladies, awesome idea. I think this is a great idea! I wish I didn't live in Canada because International shipping would be outrageous. (I just calculated shipping a five pound parcel would be almost $50.00!) Yowser! I could send the same within Canada for $13.00. If, however you do have anyone interested in Canada I am in please! What a great idea - will send you an email tonight. I would love to join this - an email will be on it's way to you tonight. fantastic idea! Looking forward to sending off my tin full of goodies ... and receiving one too! I would love to join. That is if no one minds sending to San Diego. I'm willing to ship anywhere. I'd love to join in too if I may. I'll email you a little later when the little one is in bed and not on my knee pressing keys!